Parenting, Marriage and Lifestyle | by Ashley Lee: Ready to Nom at Beanstro? I was 18 when I worked as a part-time barista for Coffee Bean & Tea Leaf (CBTL) during the Summer holidays. 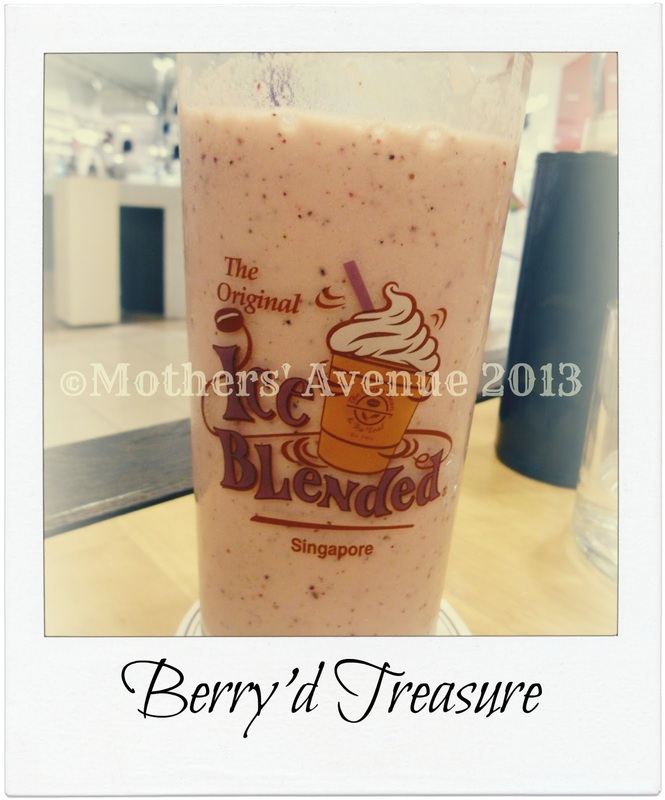 I was attached to the outlet at Wheelock Place at the heart of Orchard Road. I remembered making a mess out of my ice-blended drinks on my first "official" day at work and even though I was a part-timer, I took my job very seriously. With training at the head office, I was determined to be a "pro" by the 2nd week at work. I did it... and the rest was history. Couple of days ago, I was invited for food tasting for Beanstro by Coffee Bean & Tea Leaf. 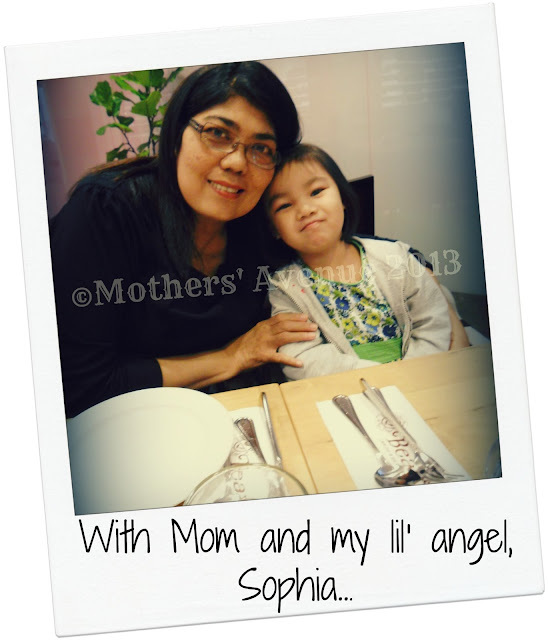 After a few emails, I was there at 6pm for my so-called dinner and I brought along mom and Sophia. It was a good mix of consumer on our table; the kid, the young mother (ahem*) and the old mother. After becoming a mother, I became more particular with where I dine as I need comfort and kids' meal menu. Ok, maybe not a full menu for kids but at least a few selection for my picky little eater. I don't know about your kids but my kid is one special case. 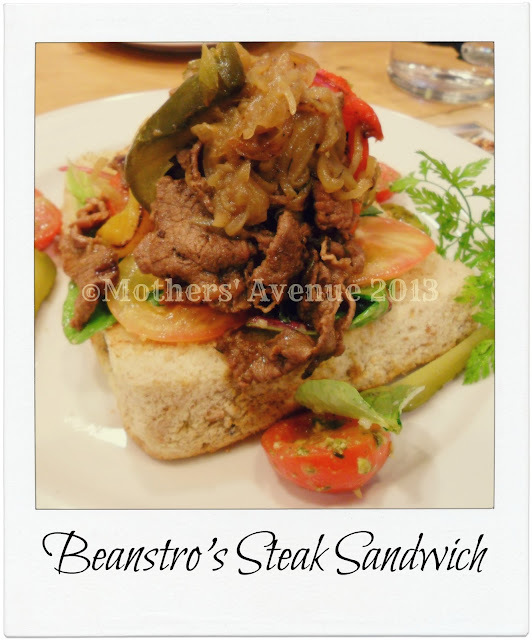 Beanstro has opened its 2nd outlet at Takashimaya, after their successful 1st outlet in Marina Bay Sands and in the world. Yes, it's the first in the world. You can go to their CBTL website and learn more about their heritage. They will be opening two more outlets in Singapore so watch out for that! To be very honest, all these years, I was hoping CBTL would expand into something "bigger & better". Well, they did it. Just so you know, they are HALAL certified! I'm a sucker for good service. I appreciate good service staffs, especially when I have a kid. I can enjoy the food in a restaurant but if the staffs display bad attitude, I will not patronize that oh-so-good restaurant anymore. I'm grateful to Beanstro's service staffs as they patiently going back and forth with napkins and making sure my daughter is doing okay cos' my child didn't wanna sit on a high chair. Restaurant Manager Steven Dason IS the bomb-dot-com for that evening. He was patient, friendly and efficient. (Thank you, Steven!) The crews were all smiles to all customers dining that evening (as per my observation) and that's a definite plus point for me! *ding-ding-ding* Steven answered my questions on the food accurately without hemming and hawing and that, too, scored another point. I asked him for some recommendations and he sure did a good job on that as well! 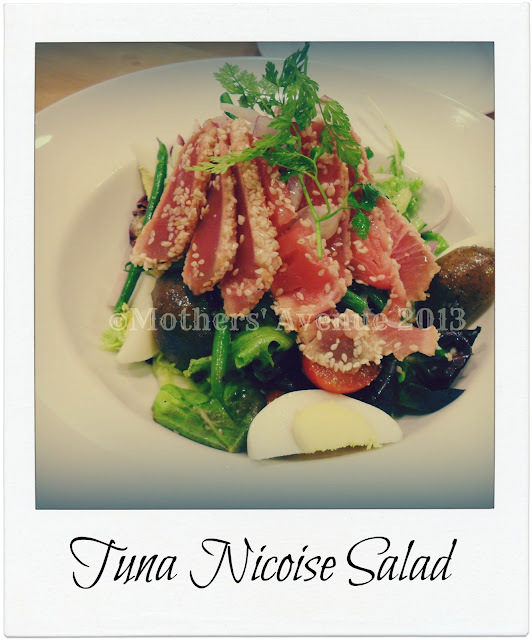 I love the dressing for this delish salad and the yellow-fin tuna? Exquisite, especially with the crunch from the sesame seeds! Ok, this bad boy here.. literally blew my heels off! 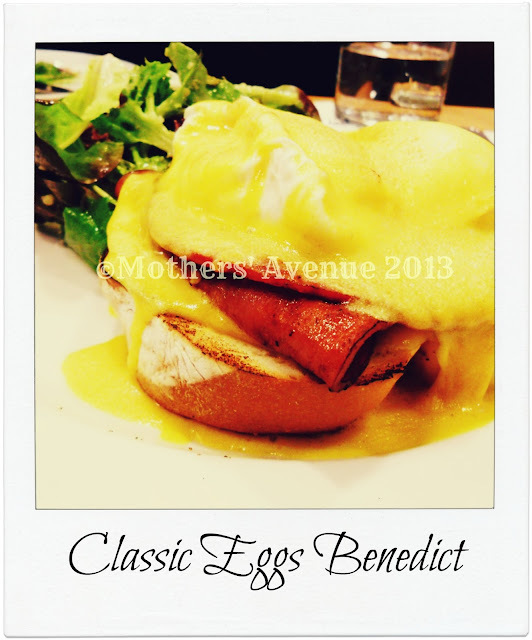 I had tasted many Eggs Benedict and I must say, it's the poached eggs that make all the difference in this classic brekkie plate. Steven assured me that Sophia and me will LOVE this dish. PLUS, he told me confidently that the poached eggs would be the best I've ever tasted; runny with perfection. Man, he was right.. and spot on cos Sophia ate the chicken ham and the toast! Sophia didn't want the eggs cos she's still exploring with them so I didn't wanna force her. But I cleaned up the plate, including the side salad. Another star on the plate? The hollandaise sauce. Blown away, seriously. Alternative choices of spinach or smoked salmon, instead of chicken ham would be a plus. Simple plating, which is good as the eyes will feast on the colors of the dish. Mom ordered this sandwich and she loved it! There was a side serve of horseradish mayonnaise which both of us thought it was not necessary. The authentic flavours from the gherkins, roasted peppers & caramelised onions were good enough for the entire palate. The sirloin was cooked to perfection. The meat was lean and the portion was just right. We agreed that the caramelised onions could be cooked just a little longer, to be really soft and flavourful. You know for sure you ain't overeating with the given portion. I ordered this for Sophia for she, being the queen of salmon, will eat salmon cooked in all ways, except smoked. She enjoyed it thoroughly and even ate the corn cob! I had too much greens in me that I couldn't eat the side salad that was served together with this gorgeous dish. 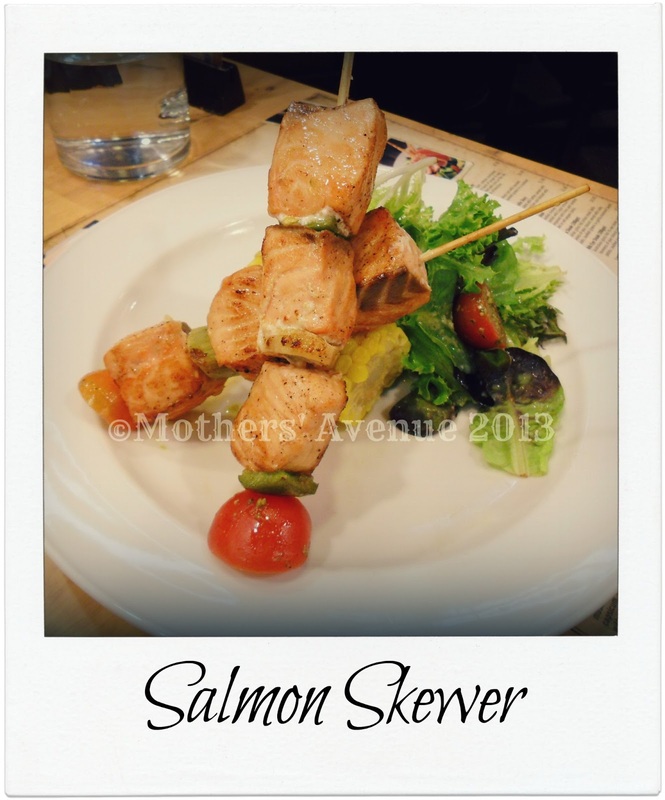 The (fresh) salmon fish was grilled perfectly and very moist. The peppers, which was grilled together with the fish literally absorbed the juice from the fish itself. This is a very good portion for kids (if they like salmon). We loved this dish so much! Mushrooms could be another alternative for the peppers (or add-on). I couldn't really taste the marinade of ginger and soy sauce. I believe it's supposedly Japanese inspired? Perfect for ladies and kids! 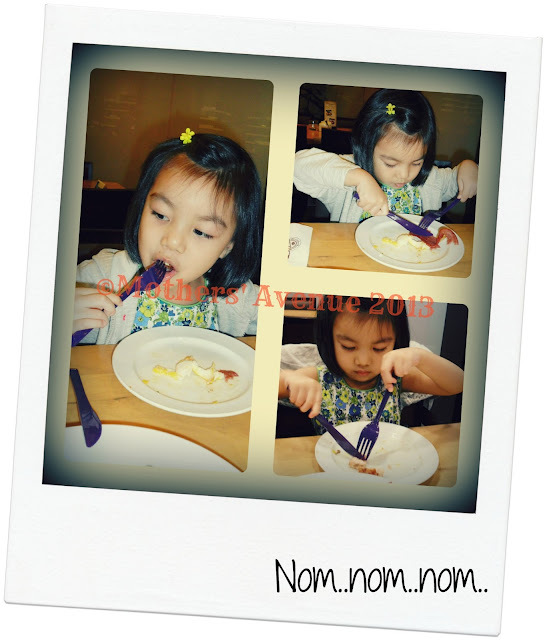 Sophia enjoying the Classic Eggs Benedict (without the eggs) and cleaning up the last bit of the salmon! After dinner, we had to treat ourselves to something sweet...!! Shockingly "big" for a dessert. My all-time favourite dessert. However, this creme brulee (aka burnt cream) has a very strong egg taste, as compared to all the other creme brulees I've ever tasted. Interestingly, it was served with diced strawberries with a side of whipped cream and biscuit. Overall taste was pretty good, I would say. The strong egg taste can be quite a turn-off after awhile. I personally prefer the strawberries served in halves (or whole), as opposed to diced. 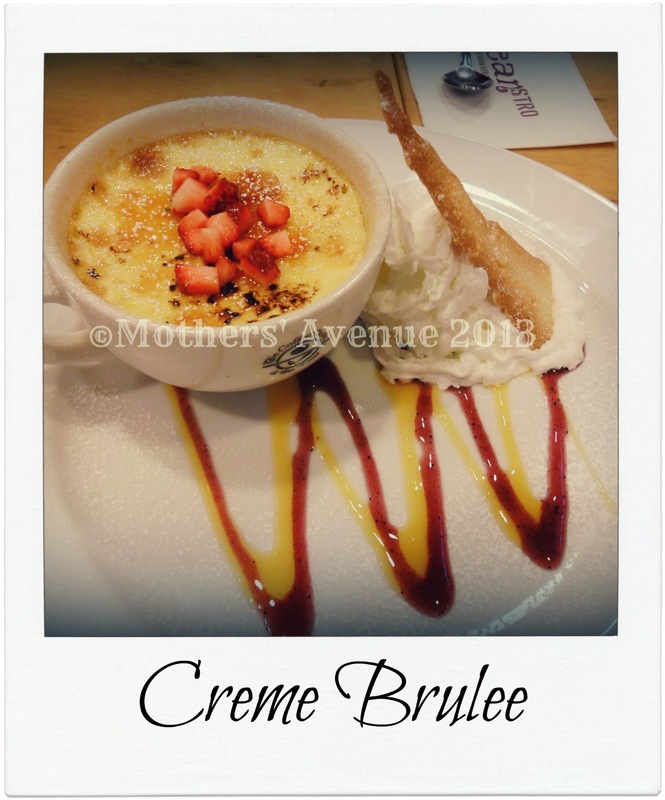 Please share with your dessert partner-in-crime cos the portion is big for one, unless you have an ultimate sweet tooth! This Italian classic is usually made with dark rum for that alcohol kick but because this is a Halal-certified restaurant, no alcohol is allowed. Nevertheless, it still tastes absolutely delightful. 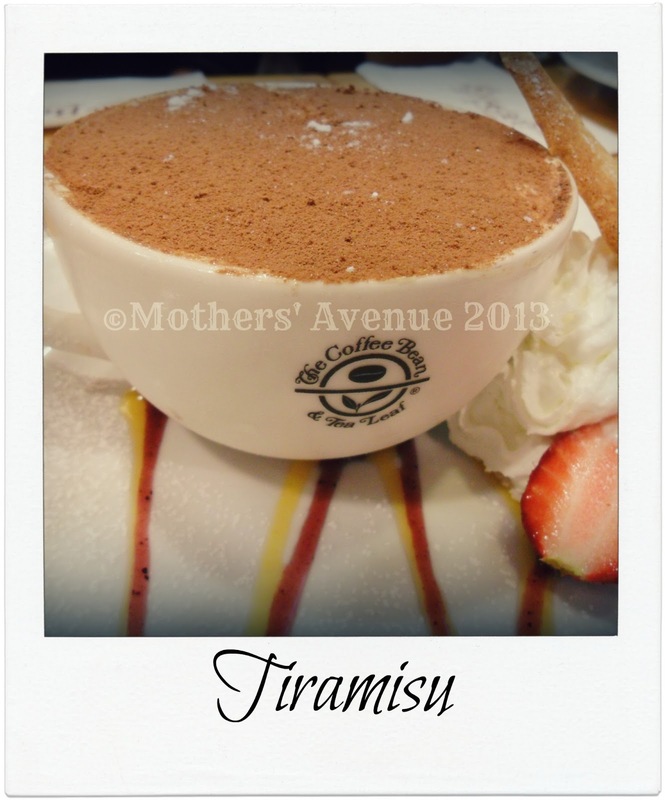 I loved the rich taste of the mascarpone cheese and the aromatic coffee fragrance. The biscuit layers, however, didn't taste like Italian ladyfingers or Savoiardi. I'm not too sure how it was done but it could have been prepared even better. The portion needs to be a size down, especially after a hearty meal! The price however, was a shocker for such a portion and taste. Nope, not telling you how much it is! Again, please eat it with someone. Unless you're selfish. Beanstro offers Weekday Set Lunch Special (complimentary soup, coffee/tea with any pasta or main course) from 11am-3pm and Tea Time Specials from 3pm-6pm, with a choice of either sweet or savoury treats and each set comes with either coffee or tea. If you're going for lunch, tea or dinner with a group of friends, I would suggest making a reservation. So, you ready to nom? Disclaimer: All honest opinions of my own. There was no monetary compensation offered, only an invitation for food tasting at Beanstro by The Coffee Bean & Tea Leaf.